We arrived at Anne Frank House at almost 2:00 PM on Boxing Day, slightly apprehensive that it might remain closed. However we were happy to find a long queue just in front of the museum. The GPS device helped us locate it from museumplein without any difficulty. The atmosphere was lively - many visitors were seen having a nice time near the long canal and around Dam Square. There is certainly something special about Amsterdam and the nearby places which I have witnessed every single time I have come out and visited these places. Anne Frank, along with 7 others remained under cover for 2 painful years in this very house(1942 to 1944). A visit to this place today does bring memories from those dark days of 2nd world war when Hitler's wrath was in full swing devouring the length and breadth of Europe. On the receiving side were many - Anne Frank was the one which came to limelight because she loved to write... In her secret diary was captured her feelings - the innermost - which the world would have never known had she not written the vivid description of each passing day - the thrill - momentary happy moments followed by fear... pain of not having enough food - the cautious moves and restraints necessary to avoid any noise at any cost... the suppressed desire to go out and dance in the open air - the suppressed desire to lead a free life. All of these were captured in that secret diary. They were finally caught in 1944 and had to enter the infamous concentration camp. The Diary of Anne Frank was published in 1947 by Otto, her father - who had only managed to survive. It was this diary which made the whole story accessible by the world. Anne Frank's story became hugely popular. People empathized with her sad story and also fumed in anger with Hitler's deeds. Horrific and unjust acts of violence targeted on innocent people - that no amount of explanation can justify. This place is filled with the vibration of torture, impatient breathes, whispers yearning for freedom, stealthy moves, long and unending silence - written all over - inside every square inch of space - only separated by timescale - and that is so powerful and overwhelming. The visitor can't escape this strange emotion and feeling. And I could see that written all over on their faces - while they were busy scrutinizing the wall, floors and the entire space, in all possible detail. 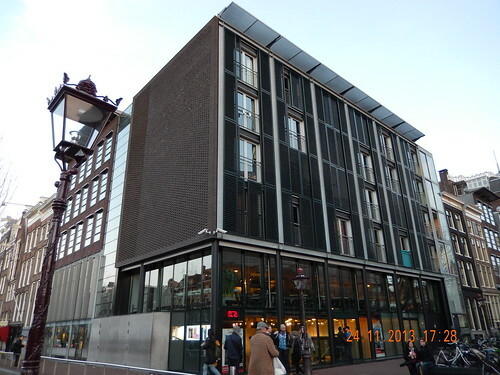 It is a must-visit place - because there are many facets to Anne Frank which can only be complete if one visits this house. It is sad but this knowledge is very important for the future. The knowledge of ugly yesterday can only help us rectify our present so that we can lead a happy and prosperous tomorrow. Up until now I was delaying going to this place - because I knew - that this is a sad story - and what possibly could I discover which I already didn't know?